Since there was no 10k I decided that trying another long run and figuring out fueling was more important over speed and timing. Runkeeper was screwy, it didn’t pause properly when I stopped to do a blood test at mile 6 – you can see it in mile 7 (75 minutes for a mile?!). Categories: Uncategorized | Tags: fueling, long run, perfect bloodsugars | Permalink. This was my longest run since the summer (as will be all future long runs). noted that this was an evening running. This is the most consistant my bloodsugars have ever been during a run – especially for a longer one. 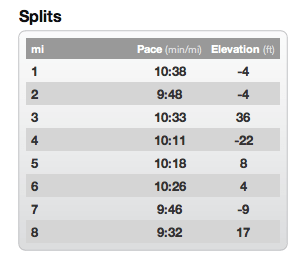 Felt like a strong solid run – not much different than a 3 miler. No notable pain / tweaks – wore compression sleeves. Categories: Uncategorized | Tags: Afternoon Run, awesome run, central park run, fueling, long run, perfect bloodsugars, running first, Weekend Run | Permalink.